A thyroid abscess caused by acute suppurative thyroiditis is an uncommon disorder affecting the thyroid gland. The eminent feature of the thyroid gland in its resistance to infection happens to be a rich blood supply and adequate lymphatic drainage. Concomitantly, the high iodine content of the thyroid gland is also bactericidal. Acute suppurative thyroiditis, which leads to primary thyroid abscess, is an unusual type of head and neck infection which in a paediatric age is quite rare. We have the opportunity to present such an appreciable case. 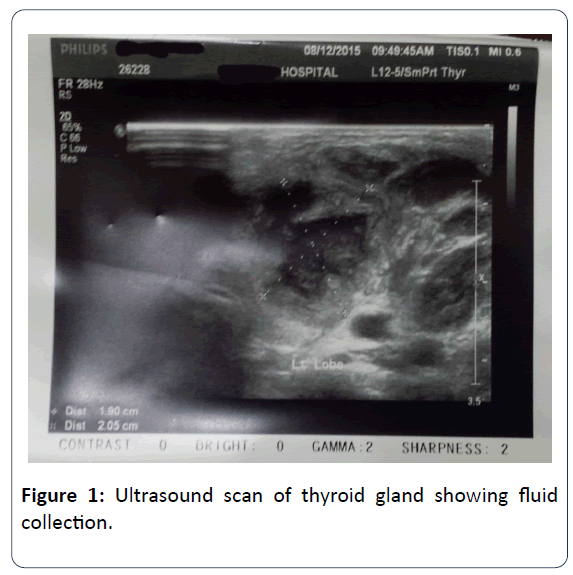 Ultrasound imaging demonstrated a fluid collection in left lobe of the thyroid gland. No surgical treatment was carried out and the case was treated successfully by oral antibiotic therapy. Thyroid abscess is not a frequently encountered case in ENT or paediatric clinics . Amongst thyroid disorders, thyroid abscess and acute suppurative thyroiditis constitute from 0.7% to 1% of all cases. Acute suppurative thyroiditis is an overtly rare and uncommon clinical event . The presentation of abscess in thyroid tissues and, top of it, in the age group of children, is quite rare. Routinely, it manifests as neck swelling which is associated with febrile illness. Usually, one of the lobe of thyroid gland shows exquisitely tender erythematous, and warm swelling with fluctuancy. The diagnostic tools are clinical examination and radiological features. The treatment comprises of: oral or parenteral antibiotics, percutaneous aspiration or a surgical incision and drainage. The rarity of infection in the thyroid gland is attributed to its unique features: fibrous encapsulation of the gland, high local iodine and hydrogen peroxide concentrations, a secluded anatomical position, extensive blood supply and efficient lymphatic drainage . This makes the gland remarkably resistant to bacterial infections. However, certain congenital malformations, such as pyriform sinus fistula or thyroglossal duct remnant, assist in the development of infection. In addition to it, haematogenous and lymphatic spread as well as direct invasion from surrounding infected tissues may result in acute suppurative thyroiditis. The main offending agents of this are gram-positive streptococcus species . The rupture of abscess into the trachea or oesophagus is also possible. In spite of outpatient parenteral antibiotic therapy, a majority of cases require surgical drainage in combination with the removal of any contributing anatomical abnormality in order to minimise the recurrence of the abscess formation . A young girl, 5 years of age, was brought to the ER when she was running a fever continuously for the last four days. The fever was of high grade, i.e., 390 C. The fever was not associated with chills or rigors and she used oral acetaminophens to get relief. Her past history was insignificant. As far as the general physical examination was concerned; a girl of normal height and built, febrile with no positive findings in chest and abdomen. She was suffering from a mild cough and rhinorrhea with mild erythematous pharyngitis. She developed neck swellings two days before arrival which leaded to painful neck movements. The thyroid gland was warm, tender and softly swollen more on the left side of the neck. Initial laboratory investigations showed white blood cells (WBC) count of 11 x 103/mcl with neutrophilia of 60.4%, C-reactive protein (CRP) was 96 mg/l, Erythrocyte sedimentation rate (ESR) 80 mm/hour, Thyroid function tests [T3-6.26 pmol/L(3.69-8.46 pmol/L), T4-18.39 pmol/L (12.30-22.80 pmol/L), Thyroid stimulating hormone (TSH-)2.05 miu/l (0.70-5.97 miu/L)] Ultrasonography of the thyroid gland showed collection measuring 20.5 x 19 mm at the left lobe (Figure 1). She was started on Amoxicillin-clavulanate. She responded spectacularly to it and it continued for five days. Figure 1: Ultrasound scan of thyroid gland showing fluid collection. Thyroid abscess is an uncommon presentation and it is the rarest form of thyroiditis [4,6]. If it happens, the victims might be immune-compromised . Some cases have been reported with vocal cord paralysis and others without any symptoms . Congenital pyriform sinus fistula is being regarded as an important cause of this illness. The third and fourth branchial anomalies represent 2%-8%. However, third branchial fistulas are rare. Various radiological procedures assist in diagnosis, including ultrasonography, computed tomography (CT), CT-fistulography and magnetic resonance imaging (MRI). Surgical exploration is the only method of differentiation among third and fourth branchial fistulas . Diversified treatment options have been reported from surgery to endoscopy and combination as well. Handful methods of cauterization have been narrated including electro-cauterization, low-power diode or CO2 laser, chemocauterization or application of fibringlue or silver-nitrate. Derek  found endoscopic cauterization as a treatment of choice in this regard. Thyrotoxicosis, nodular goitre, ectopic thyroid tissues, thyroglossal duct cyst, branchial cleft cyst, thyroiditis, cellulitis of neck, cat-scratch disease, laryngeal perichondritis, retropharyngeal abscess, sarcoidosis, laryngocele, thyroid carcinoma, parathyroid carcinoma, metastatic carcinoma of head and neck, vascular aneurysm should be considered as differential diagnosis . Leucocytosis, increased (ESR) with normal thyroid function tests are common biochemical findings [11-13]. The left lobe was involved in my patient which deems to be a common effect [1,2,14]. As far as diagnostic modalities are concerned, thyroid scans often exhibit hypofunctional areas with reduced tracer uptake [4,15]. However, plain neck roentgenogram may reveal oesophageal or tracheal deviation . Ultrasonography (US) is the initial, foremost and non-invasive diagnostic tool. It provides the factual information of abscess and lacks ionizing radiations as well. It can also delineate the other important features of thyroid gland and surrounding structures. 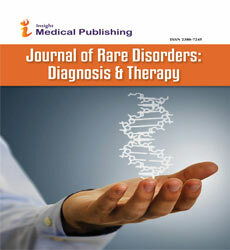 Our patient, in the same manner, was diagnosed by this inexpensive and widely accessible modality [2,4,6,12,14]. On the other hand, a Computerised Tomography scan conceals its importance to investigate for anatomic defects or fistulous formation, particularly in the younger age group and those with recurrent events [13,14,16,17] The usual pathogens are Gram Positive, such as Staphylococcus aureus and Streptococcus pneumoniae. Less common agents are Salmonella, Mycobacterium tuberculosis, Escherichia coli and Haemophilus influenza. Mycotic abscesses have also been reported [6,7,10]. Either CT guided or ultrasound guided fine needle aspiration is a simple procedure to confirm the diagnosis [4-6,10,13]. The placement of percutaneous drainage catheter via CT or Ultrasound guided can be considered as well . The recommended duration of treatment by antibiotics in acute suppurative thyroiditis is 10-14 days . Acute suppurative thyroiditis can lead to: the destruction of the thyroid or parathyroid glands, internal jugular vein thrombophlebitis, rupture of abscess or fistula formation into the trachea or oesophagus and sepsis [13,18]. Although thyroid abscess is a rare clinical condition, the diagnosis can be considered if the clinician has a high index of suspicion. Ultrasonography should be regarded early in the course of the imaging process due to its lack of ionizing radiations and its ability to perform minimally-invasive percutaneous treatment as well. There are no additional acknowledgements and no source of funding was available for the preparation of this manuscript. Shah S, Bhandary S, Natesh V, Chetri ST, Paudel D, et al. (2012) Thyroid abscess: a report of six cases. Bangladesh J Otorhinolaryngology 18: 207-211. Srinath S, Suma KR, Kumar GV (2013) Thyroid abscess in a child. Int J Health Sci Res 3: 124-127. Ambroziak U, Pachucki J, Beadnarczuk T, Pogorzelski R, Toutounchi S, et al. (2011) Suppurative thyroiditis caused by salmonella enteriditis. Pol J Endocrinol 62: 466-470. Bravo E, Grayev A (2011) Thyroid abscess as a complication of bacterial throat infection. J Radiol Case Rep 5: 1-7. Lu Y, Zhang J, Liang X, Zheng R, Li L, et al. (2014) Efficacy of fine-needle aspiration cytology for a thyroid abscess in children: two case reports. Exp Ther Med 9: 860-862. Cawich SO, Hassranah D, Naraynsing V (2014) Idiopathic thyroid abscess. Int J Surg Case Rep 5: 484-486. Herdon M, Benjamin C, Ayoub MM, Duggan AD (2007) Thyroid abscess: case report and review of the literature. Am Surg 73: 725-728. Giovani DN, Valentino V, Diletta A, Frediani S, Iannella G, et al. (2016) Recurrent pyriform sinus fistula successfully treated by endoscopic glubran 2 sealing: a rare case and literature review. SAGE Open Med Case Rep 4: 2050313X1667215. Derek SL, Veenstra HJ, Oomen KP, Speleman L, Stegeman I, et al. (2016) Surgery versus endoscopic cauterization in patients with third or fourth bracial pouch sinuses: a systematic review. Laryngoscope 126: 212-217. Spyridakis A, Kouvidi S, Tassos C (2012) A thyroid abscess presenting with neck swelling in an adult. A case report. Otorhinolaryngol Head and Neck Surg 49: 43-45. Takai SI, Miyauchi A, Matsuzuka F, Kuma K, Kosaki G, et al. (1979) Internal fistula as a route of infection in acute suppurative thyroiditis. Lancet 1: 751-752. Ogale SB, Tuteja VG, Chakarvarty N (2002) Acute suppurative thyroiditis with thyroid abscess. Indian Pediatr 39: 1156-1158. Ozdemir CS, Sozen S, Banli O (2011) Acute neck infection due to thyroid abscess. Eur J Gen Med 8: 144-7. Ghaemi N, Sayedi J, Bagheri S (2014) Acute suppurative thyroiditis with thyroid abscess: a case report and review of the literature. Iran J Otorahinolaryngol 27: 51-55. Meier DA, Nagle CE (1996) Differential diagnosis of a tender goitre. J Nucl Med 37: 1745-1747. Womack NA (1994) Thyroiditis. Surgery 16: 770-782. Llyin A, Zhelonkina N, Severskaya N, Romanko S (2007) Non-surgical management of thyroid abscess with sonographically guided fine needle aspiration. J Clin Ultrasound 35: 333-337. Alder ME, Jordan G, Walter RM (1978) Acute suppurative thyroiditis: diagnostic, metabolic and therapeutic observation. West J Med 128: 165-168.